KATHMANDU, Dec 5: Reconstruction works of heritage site in Kathmandu valley and elsewhere have been hit hard by the shortage of long timber logs, authorities said. 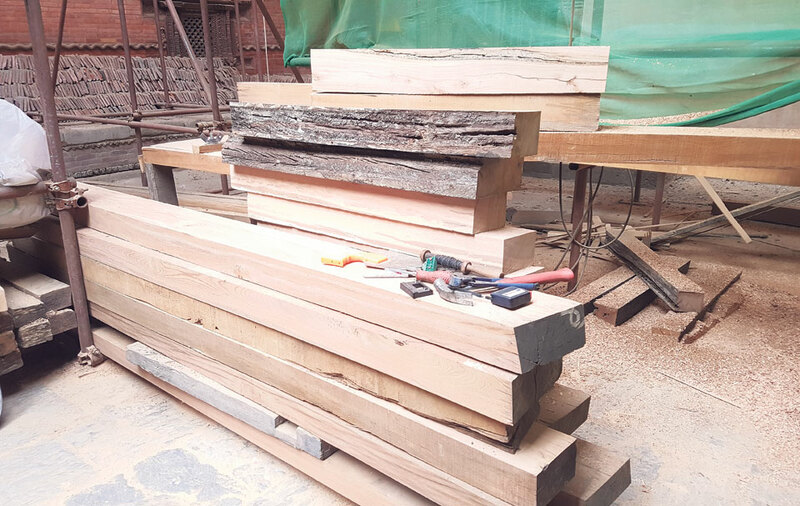 Timber Corporation of Nepal (TCN) has said that it has no stock of long timber logs to provide for reconstruction of heritage sites damaged by the 2015 earthquake. The Department of Archeology (DoA) said that it has only got timber supply as demanded for the Manakamana temple, which started renovation before the earthquake. "Although we have spoken several times with the officials of TCN, and have received positive response, the required amount of wood has been provided only for the renovation of Manakamana temple, while TCN has cited the shortage of long sal-wood for heritage reconstruction in the valley," said Sampad Ghimire, divisional engineer of DoA. Structures such as Hem Hiranya temple at Tripureshwor along with a number of other temples have been halted due to the shortage of long timber wood. "We have been unable to complete the reconstruction work of the Hem Hiranya temple due to the lack of long sal-wood that exceeds 10 feet in length," said Lila Lama, a DoA contractor. Lama who has undertaken the reconstruction of the late 19th century temple, added, "We have only been able to complete less than 20 percent of work in the temple due to the shortage of the required length of wood. Currently, we are purchasing wood for reconstruction from private distributers after calling for tender." Although non-governmental organizations and internationally-funded reconstruction projects such as the Kathmandu Valley Preservation Trust (funded by the US government) and reconstruction project of Nau Talle Durbar (funded by the government of China) are paying extravagantly for wood, government-funded projects have not been able to purchase the required wood for reconstruction. The key harvesting season for wood is during winter between November and April, when trees are chopped down in districts such as Kailali, Kanchanpur, Chitwan, Sarlahi and Nepalgunj. The officials of TCN insist that those that require long wood for construction should make a request prior to the harvesting period so that arrangements for long wood could be made beforehand. "We have so far only received demand for seven heritage sites from DoA. The supply of long sal-wood is still very limited, arrangements must be made to collect the longer woods so we have insisted the officials of DoA to inform us about the required amount of timber wood beforehand so that we can access even remote parts of the forest to retrieve the required amount of wood," said Raju Laudari, general manager of TCN. Due to the limited supply of longer logs, TCN has also suggested DoA to look for other alternatives for wood however; DoA is in a dilemma on the technicalities regarding this process. Ghimire added: "The Cabinet has instructed us that wood must be brought from TCN, however, as wood is not being supplied, we are unsure of the technicalities of purchasing wood from other sources as there has been no formal instructions by the government to purchase or issue tender for wood to DoA." He further added: "Moreover, DoA lacks storage facility. So even if we purchase wood, the question of proper storage facility and appropriate maintenance of wood arises." According to DoA, an estimated 800,000 cubic feet of wood is required for the reconstruction of the monuments. With reference to the current status quo, it can be implied that there has been a gap in communication and co-operation between the two governmental bodies.